FIXME: We really should refactor CFL to use the analysis more heavily, and in particular to leverage invalidation to trigger re-computation. Definition at line 93 of file CFLAndersAliasAnalysis.h. Definition at line 99 of file CFLAndersAliasAnalysis.h. Definition at line 900 of file CFLAndersAliasAnalysis.cpp. 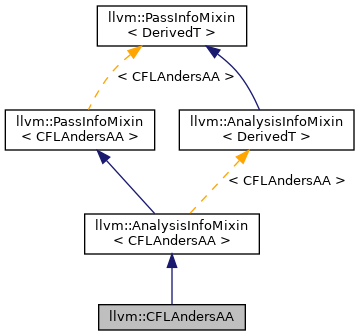 References llvm::CFLAndersAAResult::CFLAndersAAResult(), llvm::AnalysisManager< IRUnitT, ExtraArgTs >::getResult(), and llvm::CFLAndersAAWrapperPass::ID.